Breakfast is by far my favourite meal of the day, and if I miss it (which rarely happens as I would rather be late than be hungry) it really puts me in a bad mood for the day! 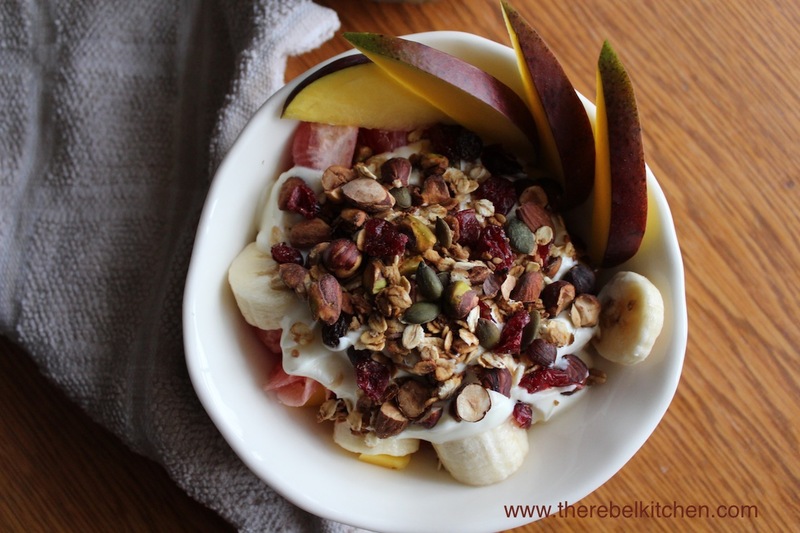 My favourite mid-week breakfasts are porridge and granola but I often find if I’m in a rush porridge takes too long, and while granola is quick, most supermarket versions are packed with sugar and are very expensive. 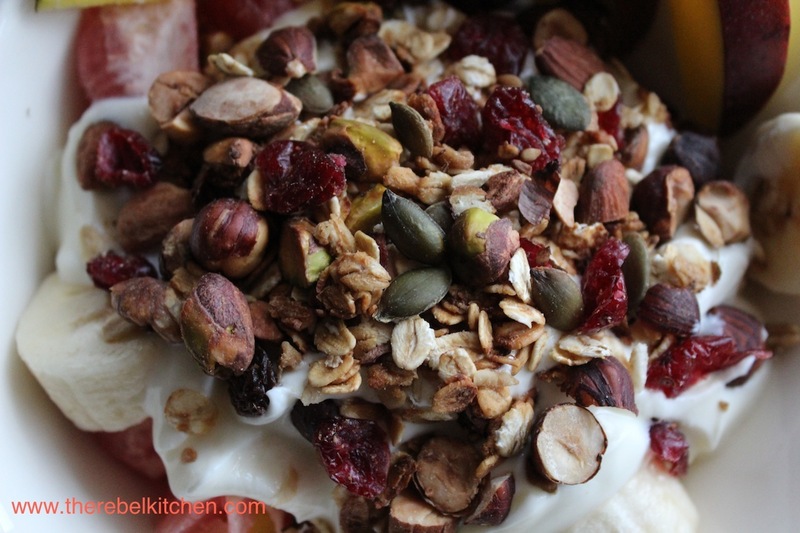 My sister started making her own healthy granola recently and I decided to follow suit! This way you can put in only the nuts, fruits, seeds etc that you love and so you’ll enjoy it a lot more. 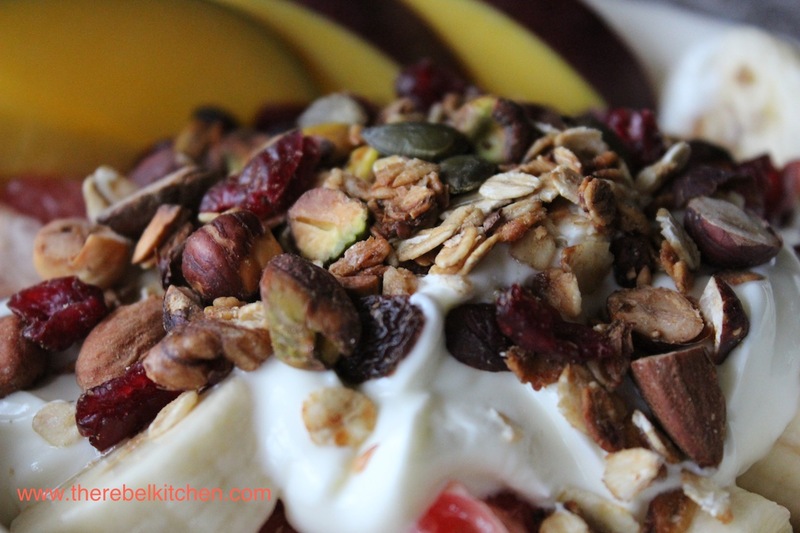 The first time you make it, you will have to buy a few bags of nuts, dried fruits etc but they will last you for a good few large batches of granola so it works out pretty reasonably. Also this probably smells better than anything you will ever cook! I defy you not to start munching on this as it cooks! 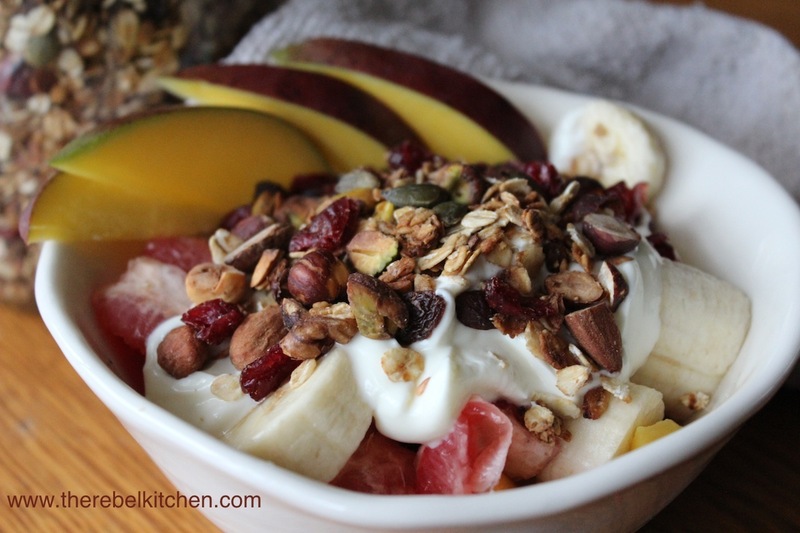 This really easy granola recipe is a very healthy breakfast that will keep you feeling happy all day long. I have given the ingredients in approximates as you may like yours more oaty or more nutty than me, so just add the quantities that suit your preferences best. Its really tasty and so good for you- a hundred times more nutritionally dense than your average cardboard cornflakes! And more importantly, it’s really delicious. 2. Melt your wet ingredients together (oil, honey, water) until they are boiled, then leave simmer. 3. 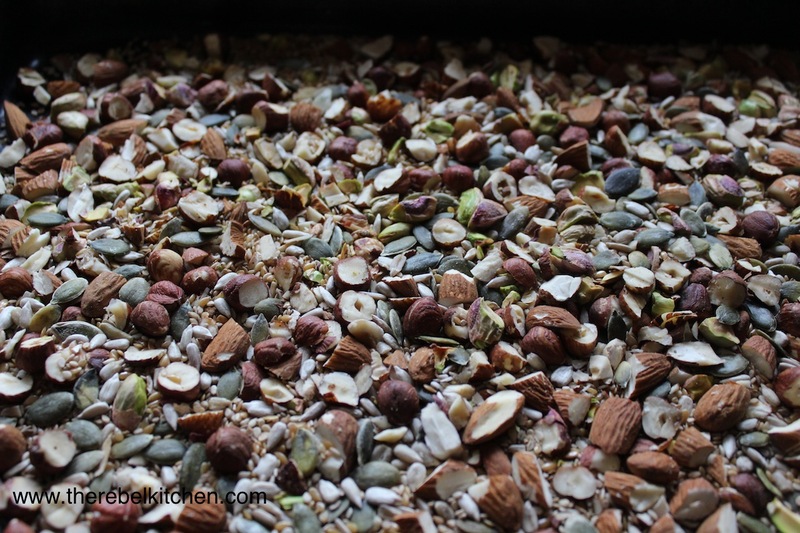 Add your oats, nuts and seeds together in an oven tray. 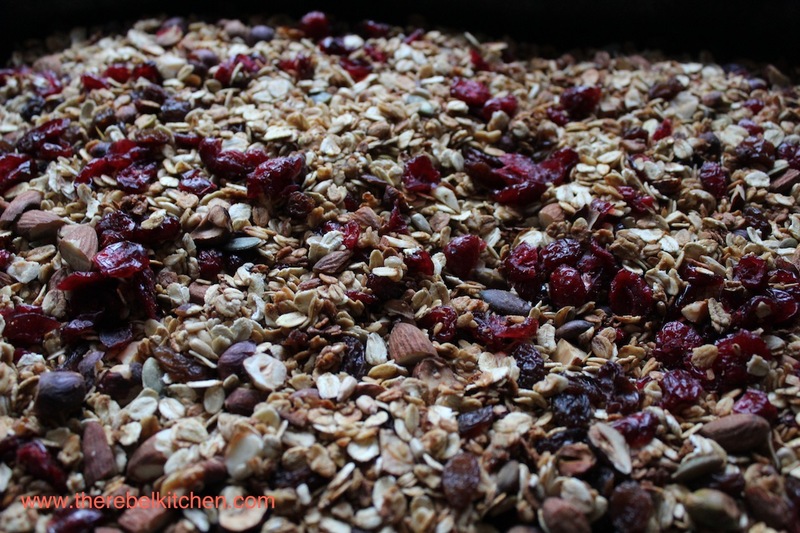 Ideally a wide shallow tray would be best as the granola will cook easier. Don’t add fruit! 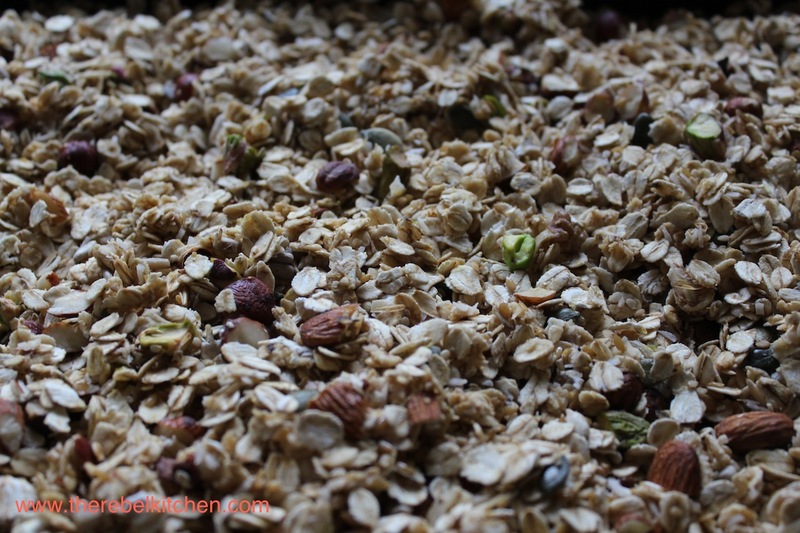 Pour your liquid over the oats and stir until the oats are coated evenly. 4. 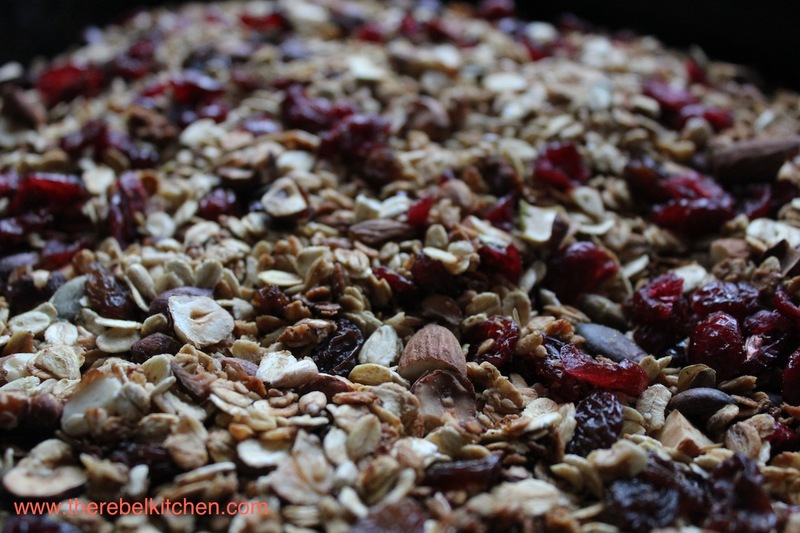 Bake for about 45mins (depending on your oven) until the Granola is golden. Make sure to stir it every 5-10 minutes to make sure it is baking evenly. 5. Remove from the oven and let cool completely (this is important as otherwise it will go soggy if transferred straight from the oven in to a container). 6. When cooled, add the fruit, place in airtight container (it’s important the container is airtight to prevent it going soft). 7. Enjoy with yoghurt or milk and the fruit of your choice! 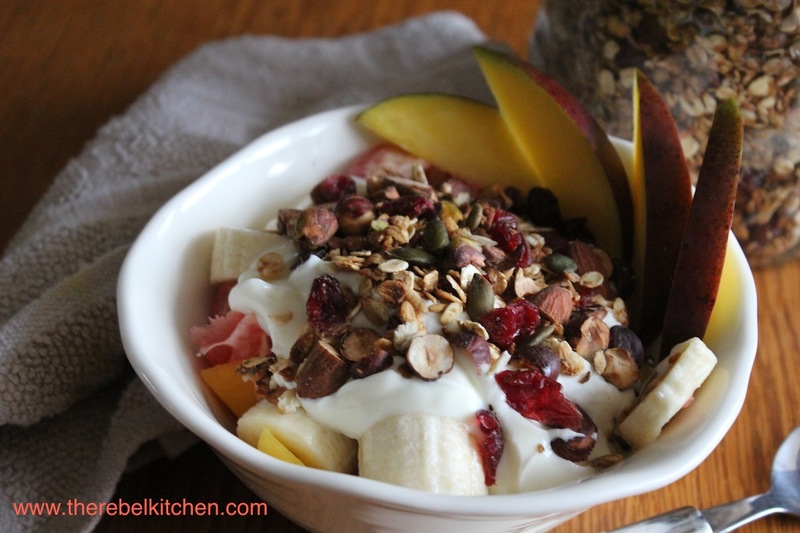 The Wife makes a pretty good muesli that is similar to this. We have been eating it most mornings for over 20 years. She grates coconut block into it and does not use any oil. I like banana and natural yoghurt on mine. She likes kiwi and a sweeter yoghurt. Thinking about it, it’s an awful lot of muesli over the time. I should really do a post about it.